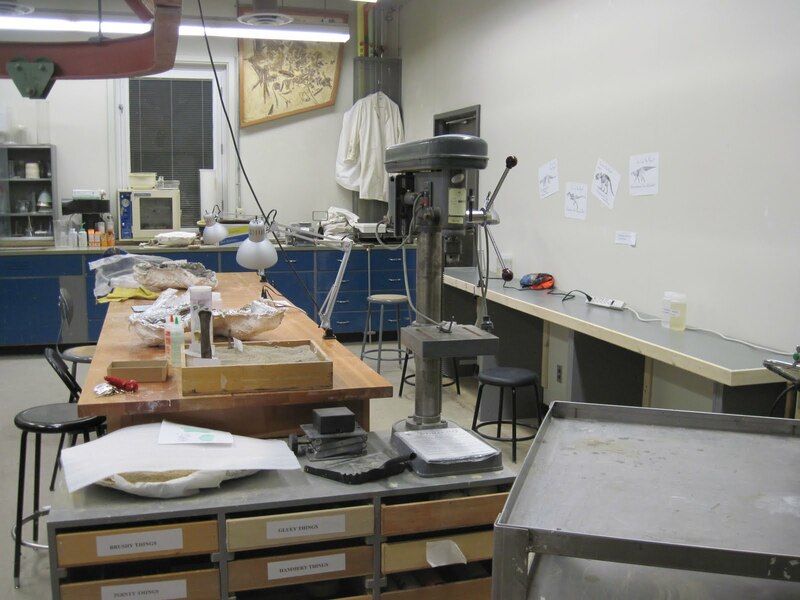 For the last several years, our lab has run a volunteer fossil prep program on weekday evenings. As the school year starts again, I thought I’d share our recruitment poster for this year! We are very fortunate to have two prep labs in the BioSci building at the University of Alberta. Our basement lab handles the larger, more complex specimens like skulls or partial skeletons. 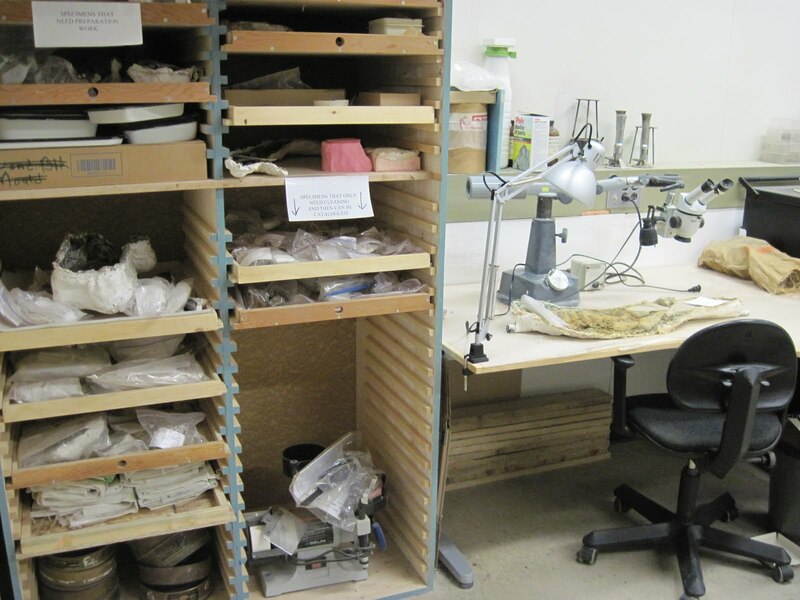 The fourth floor lab, shown here, is where volunteers help us get through the enormous quantity of smaller fossils we’ve collected. There’s lots of table space and light, and with volunteers it becomes quite sociable in the evenings! There’s always at least one grad student or upper-year undergrad present who supervises the volunteers and teaches them prep techniques. Volunteers have come from many different departments at the U of A, not just the sciences! We also get the occasional volunteers from outside the university, who hear about us online or via posters we put up around town. 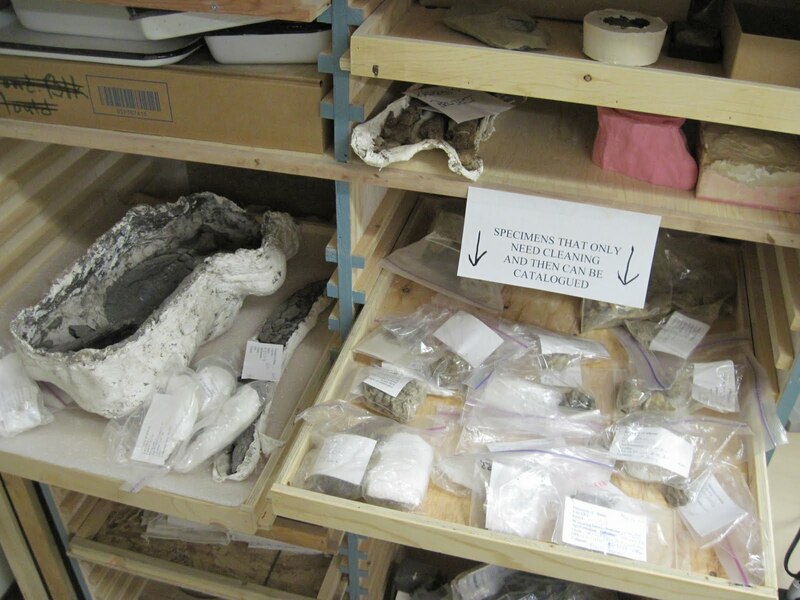 Volunteers help us prepare a wide variety of material from all over Alberta, including theropods, hadrosaurs, ceratopsians, crocs, turtles, and champsosaurs. A lot of the small material comes from Dinosaur Provincial Park and is fairly easy to prep (sometimes just require a good toothbrushing and some glue! ), but we also have more challenging projects like specimens from our Wapiti River Pachyrhinosaurus bonebed in Grande Prairie. We also have material collected way back in 1921 that has never been prepared! The beginning of the school year is always exciting and I hope we’ll see a bunch of new and returning volunteers in the next few weeks. If you’re interested in keeping up with the goings on in our lab, you can follow us on our Facebook page, Dino Lab at the University of Alberta. That poster is fantastic! I wish there was a program like this here in San Francisco. 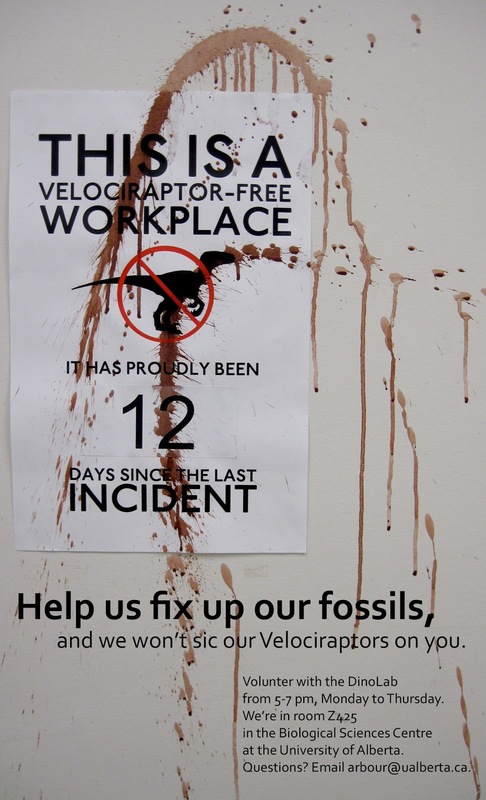 I'd love to get out and help prepare fossils. Maybe I should see if there's something like this at UCSF… it'd be a fantastic hobby and I know I'd enjoy meeting other paleo fans. I'm not surprised you get volunteers from outside the university with that poster. It's great. Definitely put them up around town!